As we continue to improve the mobile commerce experience, we’re very excited to roll out major updates to our iPhone and iPad apps for Walmart in the United States. For the iPhone, it’s all about in-store aisle location and our new In-Store Mode. For the iPad, we’ve introduced a new interactive Local Ad feature. These new mobile enhancements put more power at the fingertips of our customers, allowing them to shop our brand anytime, anywhere. We’ve expanded the in-store aisle location feature to help customers easily find products on their shopping lists in our stores. As customers add items to their mobile shopping list, they can also see the aisle where they’ll find their product. Previously a limited beta, we now offer the in-store aisle location feature for all U.S. stores and thousands of products across consumables, grocery, electronics and toys. In addition, customers can set their local store within the app, plan their visit and create a shopping list at home by scanning, typing, or speaking items to buy. One of the unique features of our app is that we pull item prices from your local Walmart store and calculate total price in real-time as items are added to shopping lists. We’re able to do that for any of our 3,800 Walmart stores across the U.S. so no matter where you happen to be, only our app helps you see the estimated total of your Walmart shopping trip before ever leaving home. This tool was specifically created to help customers while they’re shopping in our retail stores. Now, when you launch the Walmart for iPhone app from one of our stores in the U.S., you will be prompted to enter In-Store Mode. Features include scanning – price checking from product barcodes or learning more about products and special offers displayed in-store as QR Codes – and easy access to the Local Ad product list and general store information. We’ve introduced an interactive Local Ad experience that presents our customers with a preview of store specials and featured products. The format of our iPad Local Ad will be familiar to customers who are used to flipping through our printed Local Ads. They will be able to browse our Local Ads from their iPad page-by-page, with the ability to tap on a product to view more information, and purchase the item online or by visiting the store. You can download our iPhone and iPad apps from the App Store. Get on the shelf Contest Winners Announced! 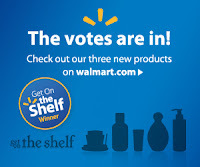 Today we announced the final winners of our popular Get on the shelf contest: HumanKind Water, PlateTopper and SnapIt Eyeglass Repair Kit which will be sold at http://walmart.com/getontheshelf. More than 4,000 inventors, entrepreneurs and small businesses from across the country entered the contest to have the opportunity to be carried on Walmart.com and in Walmart U.S. stores. The most popular products ranged from categories entered were home improvement, to personalized products items and health and wellness. Over one million votes were cast by the public to compete for the opportunity to be carried at Walmart.com and in Walmart U.S. stores. The public cast over one million votes through Facebook or text. Throughout the contest, the winning inventors went the distance to market their participation through word of mouth. Humankind Water transformed its homepage into a “war room” completely dedicated to getting votes. PlateTopper deployed humorous videos and social marketing tactics to raise visibility, including a YouTube video, which has been viewed more than two million times. Nancy of SnapIt even went to the NBC Today Show’s plaza in New York where her assistant dressed as a giant screw and was seen on national television with a sign asking for votes. We are now at the end of an amazing adventure. Get on the Shelf surpassed our expectations and surprised us all here. We congratulate the winners for their creativity and passion and thank every single one of the 4,000 contestants for taking a leap to join in the first contest ever of this kind from. Get on the shelf, launched in January of this year where contestants sent in videos of their latest inventions to be voted on by the public. During contest voting, nearly 95 percent of the participants received a vote via Facebook or text. We thank all contestants for their participation and enthusiasm for the "Get on the shelf" contest. We congratulate them for their creativity and passion. We are amazed by the visibility so many have received for their products, whether online or through traditional news media, and we hope the boost in awareness We hope the GOTS experience accelerates their your business going forward. For more information, visit http://getontheshelf.com.